Diving works is produced in a special underwater equipment operation to raise the sunken vessels, cleaning of the fairway, repair and construction of subsea structures, laying of submarine cables, etc. for short descends to a depth of 10-15 m, you can apply a mask with an oxygen device for breathing. For works at great depths apply soft spacesuits and hard phones. Soft suits do not protect divers from water pressure. In tough devices diver is at normal atmospheric pressure. Breathing diver is provided by filing with the surface under pressure clean air, which supersedes the polluted air from the suit (ventilated suits) or from special bottles, which are in spacesuit (see Oxygen-breathing apparatus). In the organization in diving operations envisaged a number of measures on labour protection and safety (mechanization, protection against electric shock , and so on). When diving works should be carried out a number of preventive and hygienic measures (see Decompression illness (DCI). 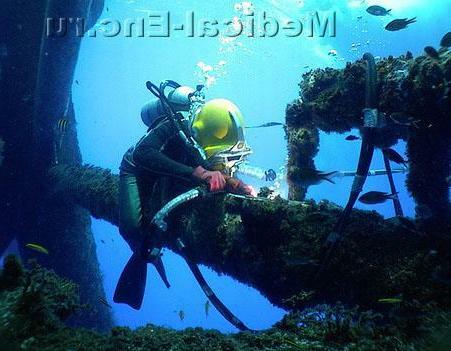 Working time diver under water up to 4 hours. in the day. Divers are medically examined upon admission to work and annually. The basic requirements to applicants: the growth within 165-185 cm, mental stability, the passability of the Eustachian tubes, normal state organs of hearing and systems of breathing and blood circulation, normal, the colour sensation and visual acuity is not below 0.6, no! persistent disorders of organs of digestion and metabolism. Medical support of diving works at depths of 20 to 60 meters is carried out by a doctor or nurse with special training, and at depths of more than 60 m - doctor-physiologist. Medical team produces the medical examinations divers before diving, and enforces the rules of the descent and ascent, if necessary, provides medical assistance, monitors the daily routine and diet divers.